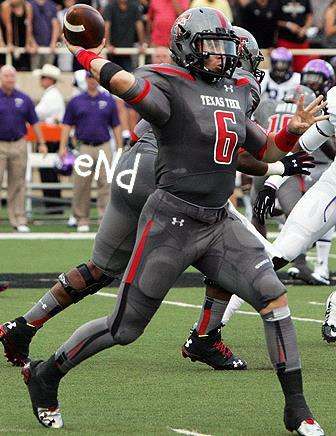 The Red...errrr...Gray Raiders took on TCU on Thursday night. Gear Head was not impressed. Let's start with the obvious. Ohio State, certainly gray, Washington State, absolutely. Nevada...yep, Kansas State, you bet. Texas Tech? NOOOOOOO! You have the best color combo ever invented other than Navy and Carolina Blue and you've taken a large dump on it. It's like ordering a Doritos Locos taco when you know you've got a chicken quesadilla waiting on you bro! Memo to Under Armor, you aren't good at designing. Anything. That's all I wanted to say about that. These are new uniforms that wick away sweat. TO WHERE? The crotch? Perhaps the thought was like the old school hypercolor t-shirt franchise. The uniforms were supposed to change colors! By the end they were supposed to turn black right coach? Lastly, Tech has a beautiful helmet. Sleek and tough looking. What's the point of only breaking it out twice a year. The gray just ain't nearly as cool. You're officially on notice Tech. If you bust out some sort of yellow or teal, you'll be put on double secret probation. Posted on September 16, 2013 by Sure Bud and filed under Southwest Round-Up, Sports and tagged Gear Head Texas Tech TCU Under Armor.